Amongst a tourism industry that is constantly striving to be bigger, bolder and more luxurious, Peter Gash is a man who makes a difference. Co-owner of Lady Elliot Island, world environment champion and ecological crusader, Gash is intent on protecting and preserving his tiny piece of paradise on the Great Barrier Reef. After securing the lease on Lady Elliot Island in 2005, Peter Gash went from pilot to preservationist, transforming the small Queensland Island oasis at the Great Barrier Reef's southern end into the benchmark for innovative ecological tourism. This was no easy feat, as the island had previously been little more than a pile of 'poo', an atoll that had been mined almost bare for its premium guano. However under the watchful eye and green thumb of Gash, the island is now a picturesque coral cay and eco-resort which instils in its guests a love for its marine environment and a passion to protect it. Australia's first island to ban disposable plastic water bottles, Lady Elliot has no high rise buildings and is powered by a Hybrid Solar Power Station which has more than halved its reliance on diesel fuel. What took Mother Nature over 3500 years to create took mere years for man to strip bare. Yet this man is using thousands of native plants to regenerate the island to its former glory, pre-European settlement. Managing an eco island resort 80km out to sea on the fringes of the Great Barrier Reef presents its challenges. When Peter Gash took over in 2005, the island went through 550L of diesel daily just to produce power. This equalled almost 200,000L per year and with diesel at $1.50 per litre, the $300,000 per annum wasn't the only unsustainable cost. The fuel needed to be barged out from the mainland, which burned more diesel and added another 540 tonnes of greenhouse gas emissions to the environment each year. Peter wasn't having it. In December of 2008 he built the island its own three-phase solar hybrid power station to combat the large power and energy demand. It remains one of Australia's largest privately-owned systems of its kind. Having halved the island's fuel consumption is just two years of implementing the solar power system, Lady Elliot uses less than 70,000L of diesel and produces less than 195 tonnes of emissions each year. Some pretty impressive results. So where did Peter's passion come from? 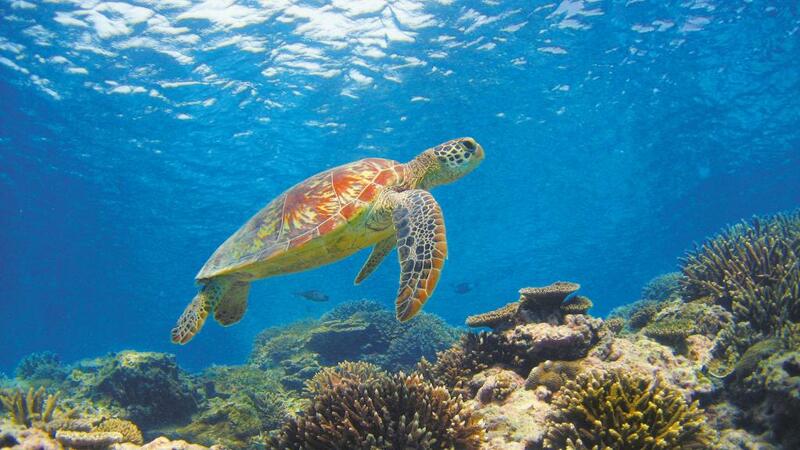 It all began with his first snorkelling expedition on the Great Barrier Reef, just off Lady Elliot Island. Captivated by the natural beauty of the island, Gash became a licensed pilot so that he could fly tourists out to Lady Musgrave Island and Lady Elliot Island. This lasted for over 20 years until simply sharing the island's beauty was no longer enough. Over time, the 'lady' had captured his heart so he did what most men love do, he made Lady Elliot his own. The island is so special to Peter for so many different reasons, but his heart has always been captured by the unique and pristine environment of remarkable contrasts. In just eight years, he has taken massive steps to reduce the carbon footprint of the island and restore it back to the way nature intended. As a jewel in the crown of the Great Barrier Reef, Peter not only wants to share the beauty with people he also wants to help educate them on what they can do - not only for the island but for their town, their city, their country, their home.